Welcome. I am posting this card for a few challenges and will also enter for SCS Hope That You Can Count on Challenge Sending Flowers. 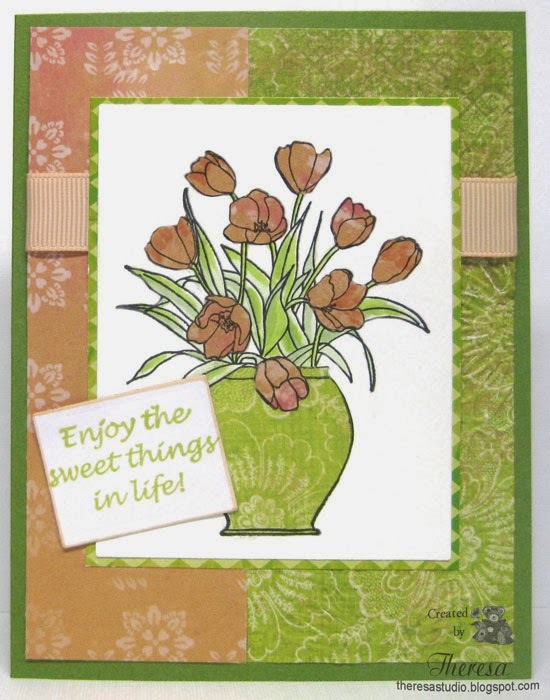 I have paper pieced the tulips and vase with pattern papers from my stash and also used the same patterns as my background on a card base of green CS. 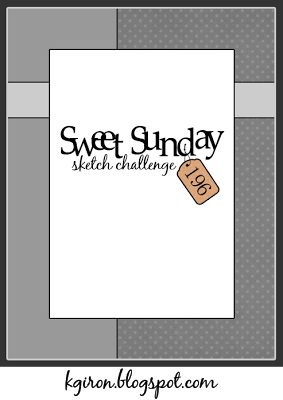 Added a peach grosgrain ribbon to complete the layout following the sketch from Sweet Sunday. Second Christmas card for today. I am trying to use some of my never inked stamps and this one is LOTV's James Bear Deck the Hall. I stamped him with Memento Espresso Truffle and colored him with Copics . I added some shine with a Clear Star pen it but does not show in the photo. 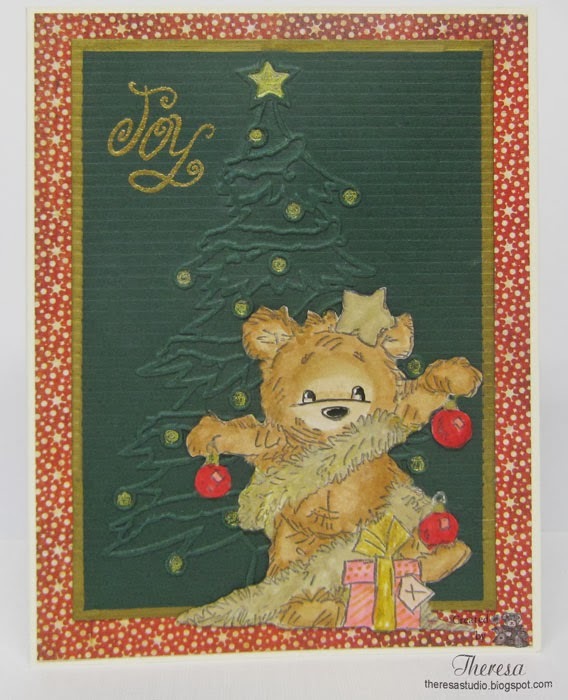 I fussy cut him to place in front of an embossed Christmas Tree (Darice EF) on green CS. I think it might have been better not to have done all that cutting but I wanted James to be standing in front of the tree that he's trimming. I added gold to the tree with Gold Jelli-pens and edged the green CS with a Sharpie Gold Paint Pen. 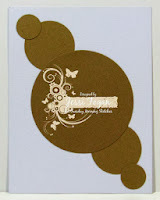 The card base is an Ivory card stock topped with a pattern paper from BasicGrey Jovial pad. 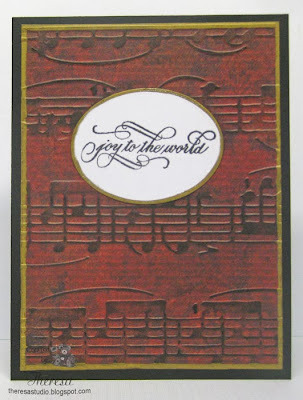 I finished with a Flourishes sentiment Joy (from Alleluia Set) stamped in Versamark and heat embossed with gold EP. James is a very joyful bear, don't you think? 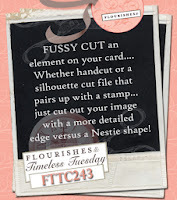 Timeless Tuesday: Do some fussy cutting. 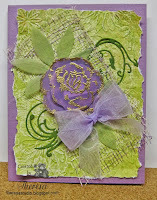 Lili Of The Valley's Monthly Challenge: Anything goes with a LOTV stamp. 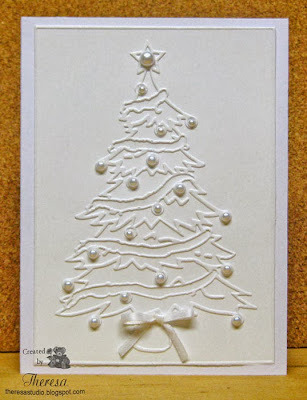 I have another Christmas card made simply with an embossing folder, a stamp, and an oval die. I embossed a pattern paper with the EF and highlighted the raised area with black ink and edged it with gold ink. I attached this to a card base of black and added on the sentiment stamped on an oval cut out in white CS edged with gold ink. All done! Craftyhazelnut's Christmas Challenge: Theme is Music. I used a music EF for the background and the sentiment is a Christmas Carol. 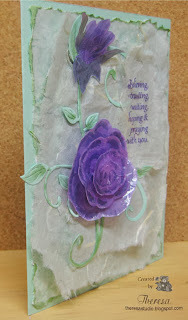 Another challenge at SCS for the Hope That You Can Cling To Campaign is to create a card using Mixed Media. I had to do research on just what that is considered ....I read that mixed media tends to refer to a work of visual art that combines various traditionally distinct visual art media - a work that combines paint, ink, and other materials such as paper, metal. 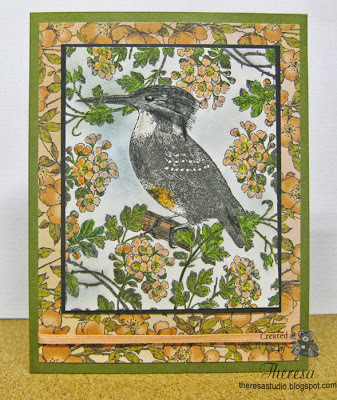 wood, shells, fabrics, and "found objects"- a combination of two or more primary artistic mediums combined in a single piece of artwork or a card in this case. For my card I "mixed" a printed image, distress inks, versamark, embossing powder, a button ( matched the design in feathers), some seam binding, and a piece of mesh (found objects). I used distress inks to create the background on which I stamped and embossed the sentiment and then double sponged on a darker ink. 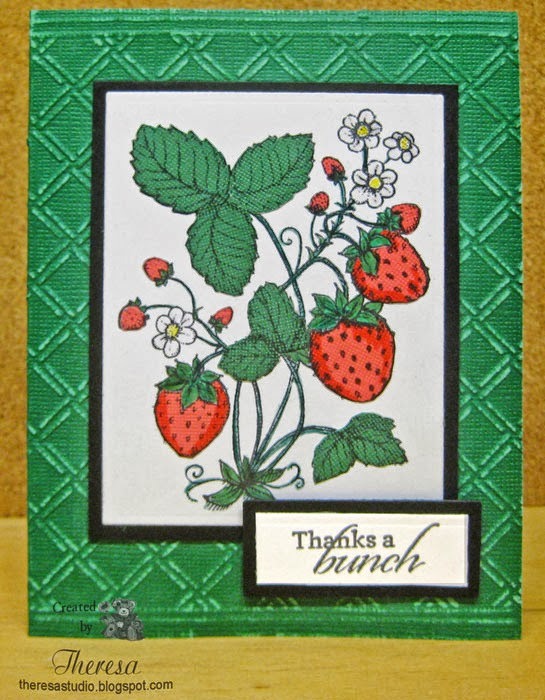 To make this more vintage, I distressed edges of image with ink and used distress tool on the mat. This may not be as complicated and layered with textures as most mixed media items but think it will pass as a mixed media card. Sugar Creek Hollow: Theme Birds of a Feather. I may have missed having a nest on my card since I was concentrating on the birds. Today I am posting a card that I made with the Tuesday Morning Sketch and a Bear Stamp that I bought at a garage sale a long while ago but never used. I did some paper piecing and Copic coloring on the image. I chose some very bright colors to make this a very cheerful card. I will be entering this at SCS for the Hope That You Can Cling To Challenge A Listening Ear. Stamp: Rubber Stampede Bearly "I Love You"
This week's challenge at Flourishes Timeless Tuesday #243 is to do some fussy cutting on an element on a card. Since I do not own a Silhouette Cameo. I do a lot of fussy cutting with my trusty scissors. I selected to stamp a Fairy from Flourishes Garden Fairies set and cut it out after coloring with Copics. I also sponged the background in blue. I popped the image up on a Lacey Doily that I also sponged in blue. 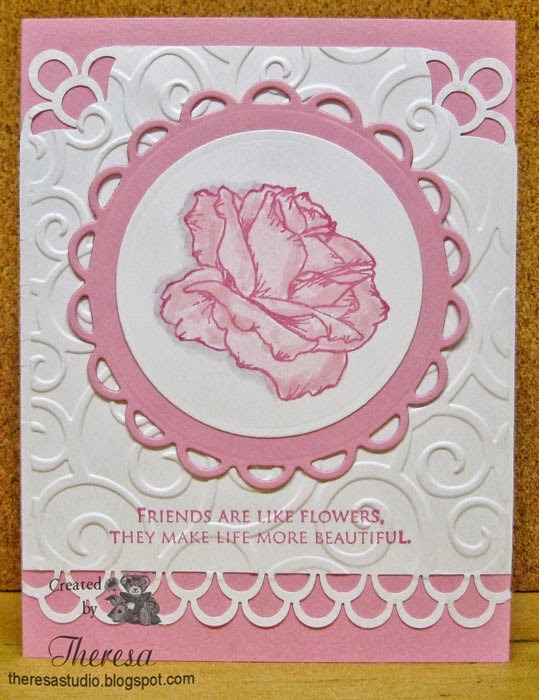 The card base is pink CS embossed with Cuttlebug EF. I added a blue satin and organza ribbon with silver threads...does not show up very well in the photo. 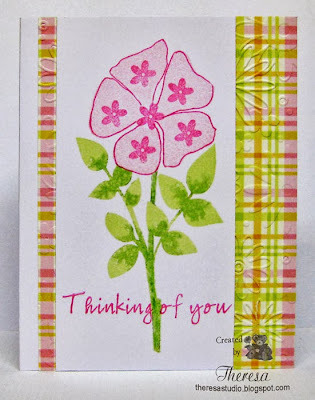 I stamped a sentiment from the same stamp set with SU Regal Rose ink on a die cut in blue CS. 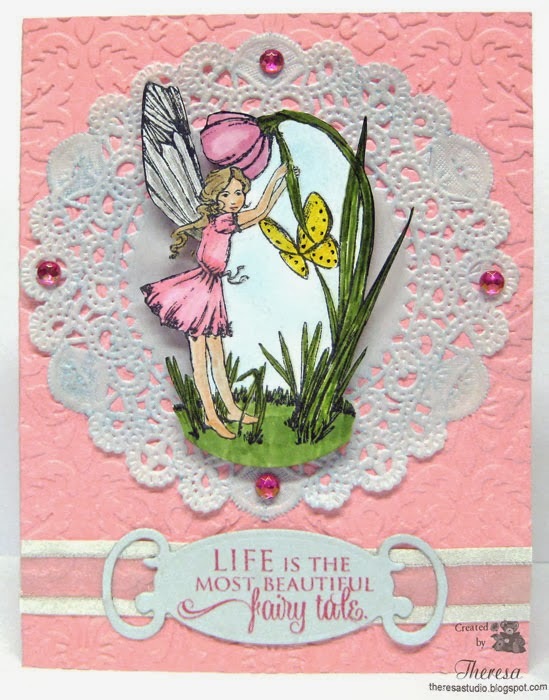 This card will also be entered at SCS Hope You Can Cling To Challenge Impossible Things Happen to make a card inspired by a fairy tale. Second Post today! Another card for a couple of challenges. 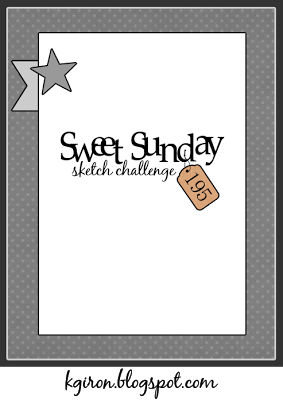 This one is for the sketch challenge at The House That Stamps Built and the theme challenge at Less is More. I stamped the Trees from Repeat Impressions and fussy cut to pop up on a circle of pattern paper. 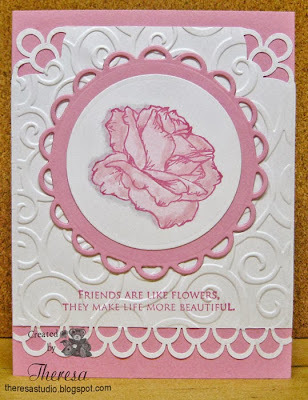 I embossed the Ivory card base with clouds for texture and dimension before attaching the elements including a sentiment from GKD. Welcome ! 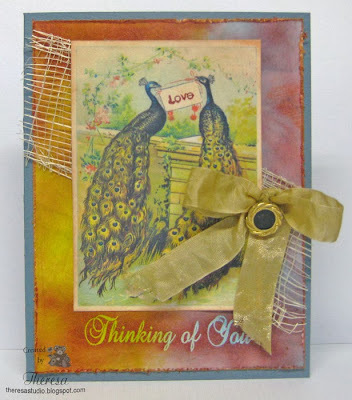 Today I am sharing a vintage card that I made for Cheery Lynn's Challenge 103 to create a Vintage card using at least one of her dies. For my image I chose a Vintage image of Lilies that I have on file from House Across the Bay. I aged the image with Distress Inks Crushed Olive, Tea Dye and Antique Linen. I cut a frame from a coral CS with the Cathedral Lace Frame die and removed the center design to frame the image. I also distressed the frame with Tea Dye Ink to soften and age the color of the frame. I assembled the card with an Olive Green textured card base, the image, and frame and added Olive Branches (Cheery Lynn die) and a Butterfly (Small Butterfly Cheery Lynn die). The sentiment from MFP was stamped in Memento Rhubarb Stalk. Papers all from my supplies. 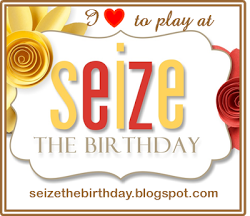 I will be adding this to SCS Hope You Can Cling To Challenge Sending Flowers. 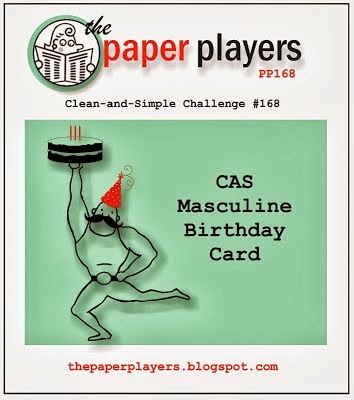 I am showing a very quick and easy masculine birthday card that I made using only one embossing folder, one ink and 2 cardstocks. I embossed a piece of Kraft with Darice EF Clocks Background and highlighted the raised areas with Memento Rich Cocoa ink. I attached to a card base of Dark Brown CS. 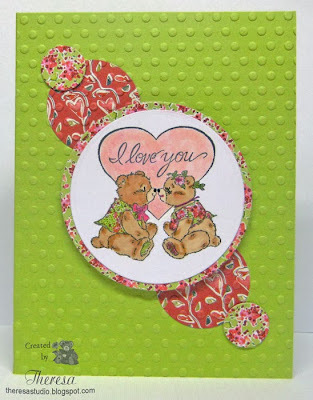 I stamped the sentiment from Flourishes and cut with a Nesties circle die and placed on my card. 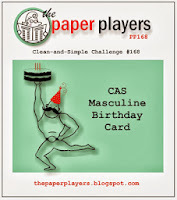 My DH really likes this card so I think it is just right for a man. In fact, my DH was with me when I was looking at some EF's and this was one that he picked out. Your teddy bear." I made this card for another SCS Hope You Can Cling To challenge to be inspired in some way by Elvis and turn it into a card. Read more here. 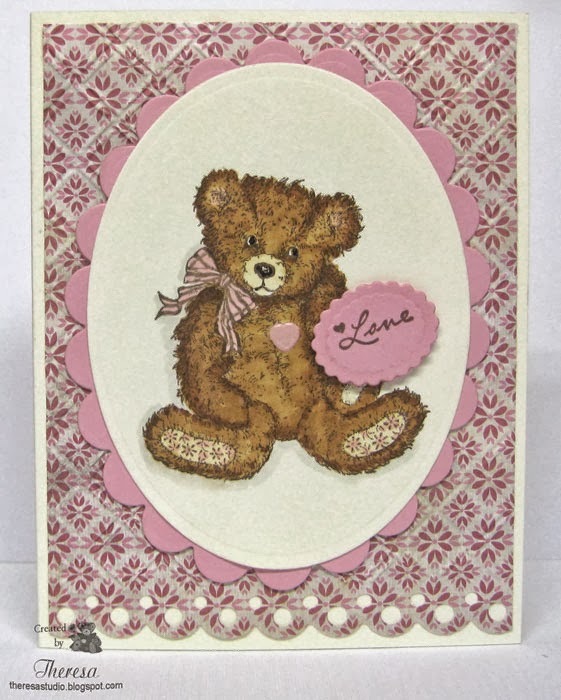 I had this great bear digi from Becky Muir of Beccy's Place in my files and used it to create a card with a sequin heart and border ...rememeber all those sequin costumes worn by Elvis. I am also entering this in Beccy's Place October Challenge to make a card using one of her digis. Thanks to my friend Patti for letting us know about that challenge. Hello! 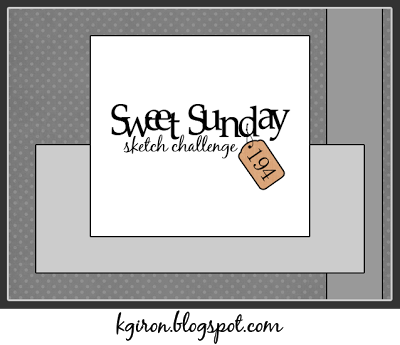 Today I bring you a card with some stormy weather that I made for Craft a Scene Challenge and used a sketch from Sweet Sunday Challenge. To begin, I searched for a picture online showing a stormy sky over the sea to have an idea how to create the look. I used a stamp from Art Impressions that I happened to win from Craft a Scene for the August challenge. I stamped the Lighthouse Scene with black ink on white CS and created the sky with Copics, sponging with inks, and coloring with pencils until I got the stormy look that I wanted. 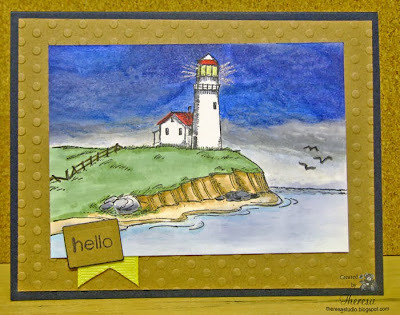 The lighthouse and shore were colored with Copics and some glow was given to the lantern room with a Clear Star Pen. Then I added some birds flying into the shore for safety. 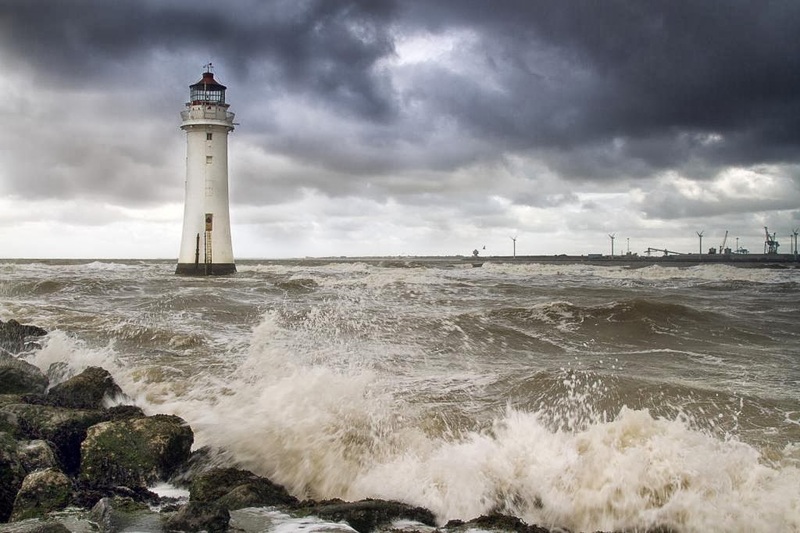 Craft a Scene: Fowl Weather-create a scene that shows a bit of stormy weather and include birds in your scene. This is the photo used as an example to color my sky. We were expecting some stormy weather-the snowy kind, but it must have stopped in Cleveland as they had 2" of the white stuff. Today I am posting another Christmas card made with Heartfelt Creations Christmas Card Collection. 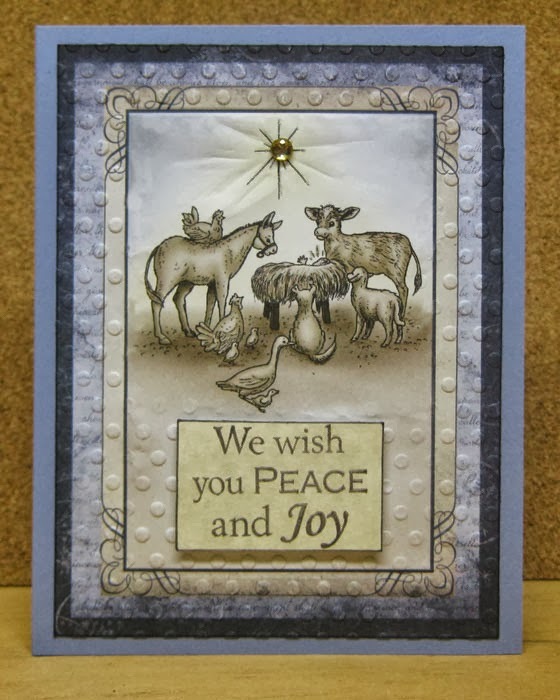 I cut a panel showing the Nativity Scene from one of the sheets that I partially embossed with Cuttlebug EF polka dots and attached to a GKD blue cardstock base. I added some sparkle with Sukura Clear Star pen and a Rhinestone in the star. The sentiment from MFP was stamped on a scrap with Memento Espresso Truffle ink and popped up with foam dots. One more down for the holidays. 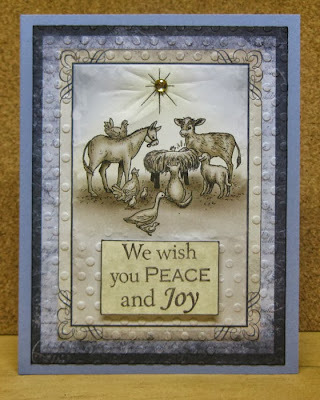 Craftyhazelnut's Christmas Challenge: Incorporate Peace into your card. Today, I have been playing with a new technique-Kissing-using a solid stamp and "kissing" that one with another stamp to give texture. (Not the same fun as kissing my DH.) I did 2 cards since I was learning to do this technique. 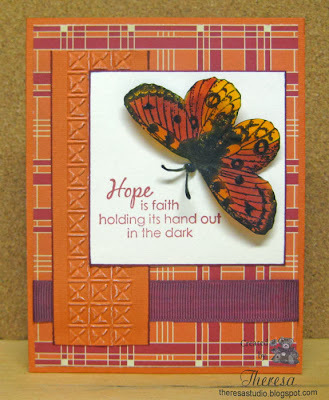 I used solid stamps from GKD and some of her pattern paper to coordinate with my colors. I am making these cards for SCS Hope That You Can Cling To challenge Kindness Is Showing Support-use KISS technique and Stamp TV Mix it up Monday Challenge STV13MON42 which is also to use the Kiss. Welcome! I am still making cards for Splitcoaststampers month long campaign Hope That You Can Cling To. I have so far made 17 cards out of the 20 challenges posted. Rather than spending a lot of time posting all the details, I am just showing photos of 4 more cards just added to my SCS gallery. 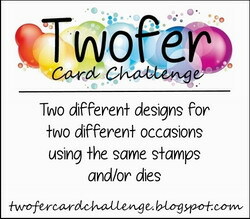 More details on my cards are listed in the gallery. I'd rather spend time making cards than typing. Rainy Day today! Good day for crafting but plan to clean the garage today and store away garden items for winter. But first I am posting anoother card made for this month's Splitcoaststampers Hope You Can Cling To campaign to support Breast Cancer Awareness. 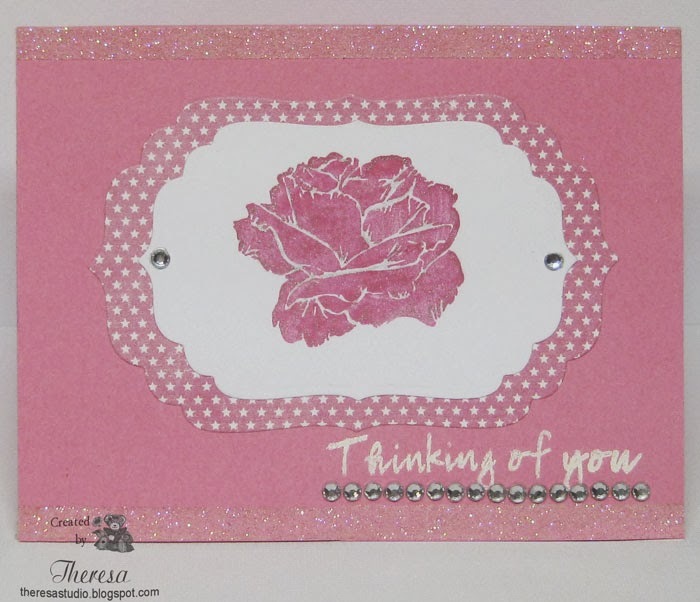 Kathy challenged us to create a card for her Let's Punch Out Breast Cancer theme using punches and dies. (HYCCT1304) Read more here. I created my card with a pink and white combo in keeping with her theme. Hello! Using reinkers and a pad of paper towels, I created these 2 cards by squirting 3 colors of ink on to the pad and then using that to stamp my leaves at different angles. 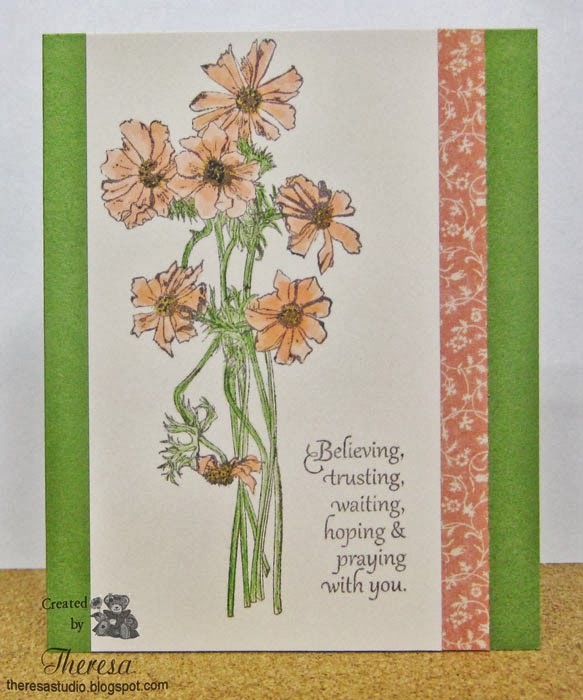 I used textured Green CS as the card base and a mat of Copper Metallic CS beneath the image stamped on Ivory CS. These are both for this month's Splitcoaststampers Hope You Can Cling To campaign to support Breast Cancer Awareness. The top card is for Lori's Challenge Peaceful Leaves (HYCCT1307) to use a leaf or leaves on your card. You may use a single leaf, as a background, the leaves on a tree, in a flower bouquet or anything you can think of! Read more about her challenge here. 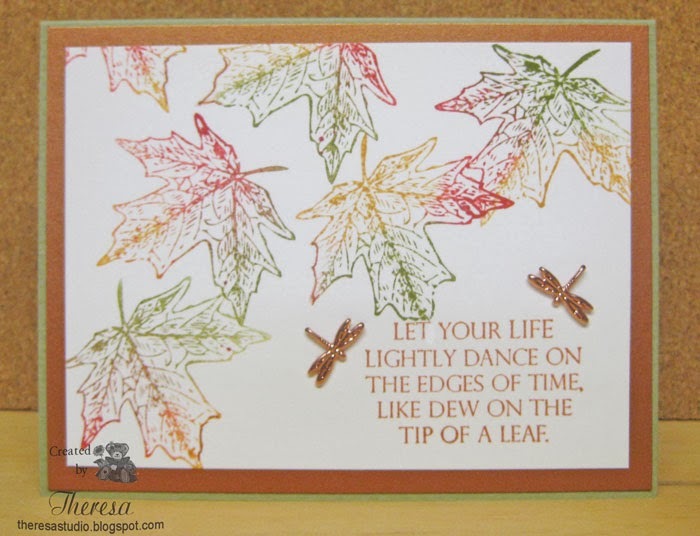 I love the colorful falling leaves at this time of the year and let that inspire this card as well as the second one. The bottom card is for Rebecca's Challenge The Strength of Steel (HYCCT1309). To celebrate that strength, show off your metal. 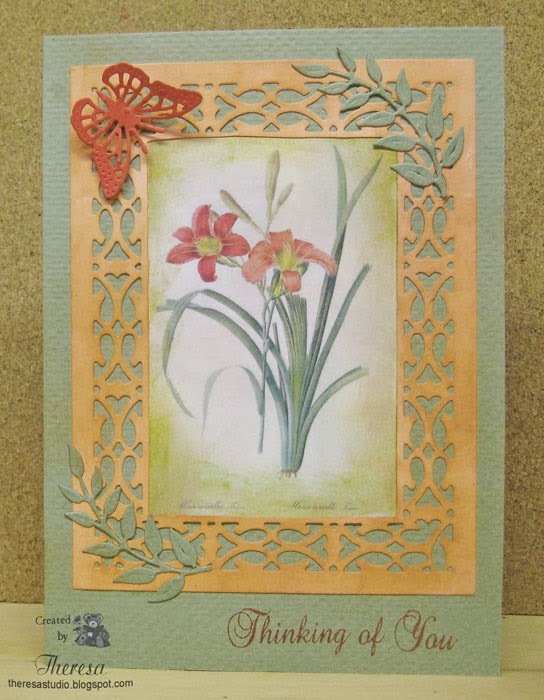 I used copper metal dragonfly brads and copper metallic cardstock for my show of metal. Read more about this challenge here. Welcome! 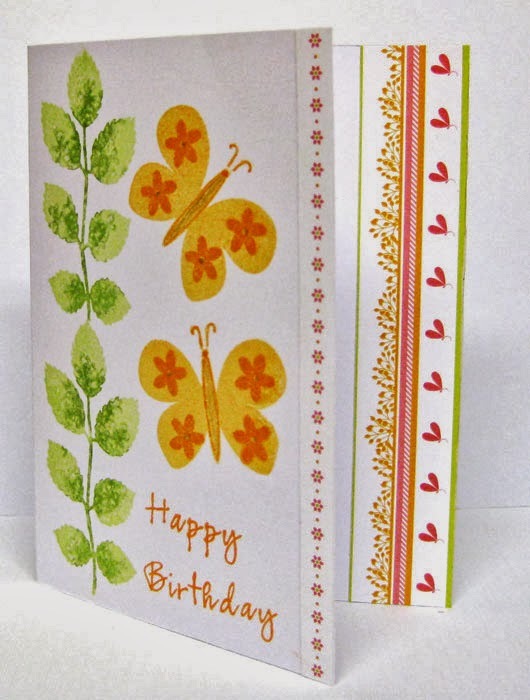 Today I have a CASE card ...I have made this card similar to another one that I made last year using the same Pattern Paper and similar colors. I recreated this card for another challenge for this month's Splitcoaststampers Hope You Can Cling To campaign to support Breast Cancer Awareness. The challenge is from Ardyth and is to make a card that's full of Peace & Quiet with no words on the front. Read more here. 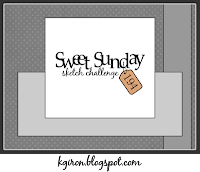 (HYCCT1311) When I read this challenge, I thought of the card that I made with the Kingfisher stamp which I used with the word Serenity because it looked so peaceful and quiet...perfect for Ardyth's challenge. Papers: White and Black CS from stash, GKD Fresh Asparagus CS, Graphics 45 Pattern from "Once Upon a Springtime"
Simon Says: Use a rubber or a clear stamp. 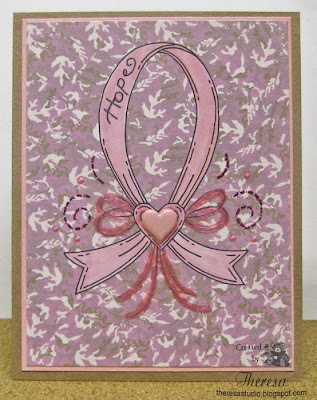 I am continuing to make cards for this month's Splitcoaststampers Hope You Can Cling To campaign to support Breast Cancer Awareness. I hope to complete all the challenges which means that I would have about 30 cards to mail to the MD Anderson Cancer Center in Houston, TX. Wish me success in my quest. 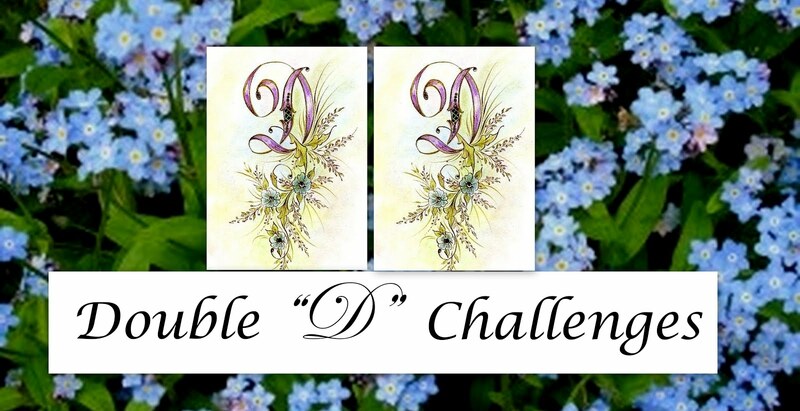 Angela's challenge is Words to Inspire You. I have chosen stamps from Verve to feature on my card. Read more here. I am keeping my words few so to make this a quick post. Today I am using a Meljen's Digital image Hope Ribbon and a Pink Camo digital paper to create a card for Lee's challenge to show our strength in Pink Camo. This is for this month's Splitcoaststampers Hope You Can Cling To campaign to support Breast Cancer Awareness. 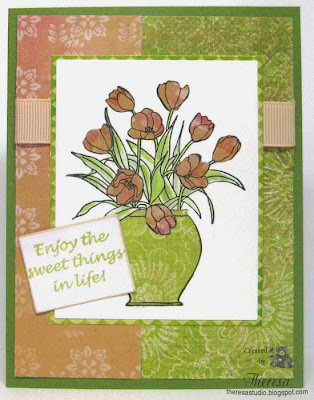 Meljen's Designs: Feeling Krafty. Used Kraft as card base and kraft coloris in pattern paper. 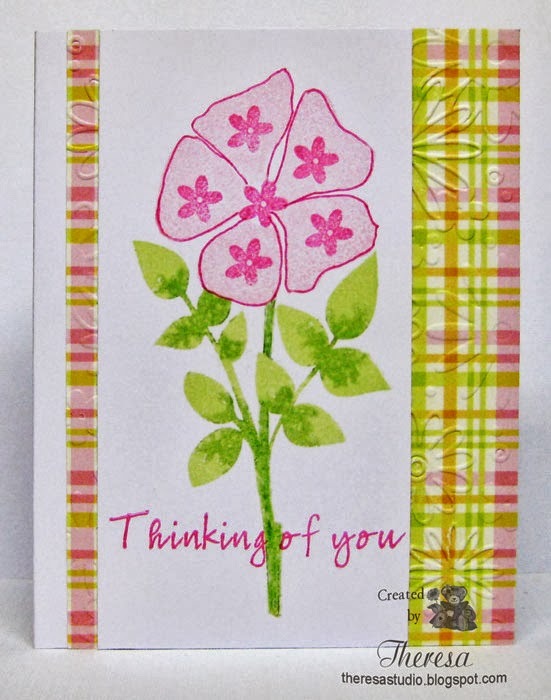 I am back with another card for this month's Splitcoaststampers Hope You Can Cling To campaign to support Breast Cancer Awareness. 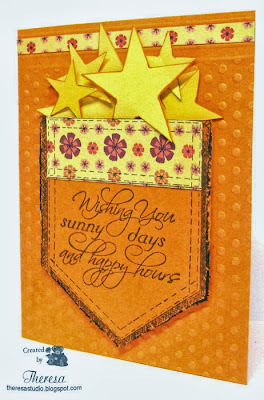 This card is for Jeanne's challenge Hope You Have a Great Day - to make a card that will put a smile on some one's face. 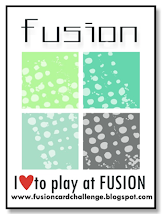 It can be a fun sentiment, a silly image or maybe some bright colors. HYCCT1302 Read more here. I do not have many silly images or sentiments but I thought this one might make someone smile or laugh out loud. Even threw in some pink Camo design for wallpaper for fun. 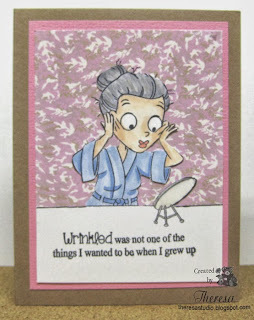 Stamp: Creative Clear Stamp "Wrinkled"
Hello! I have been making cards for this month's SplitcoastStampers Hope You Can Cling To campaign to support Breast Cancer Awareness. All of the cards made during this month for these challenges are to be mailed to the MD Anderson Cancer Center in Houston, TX. 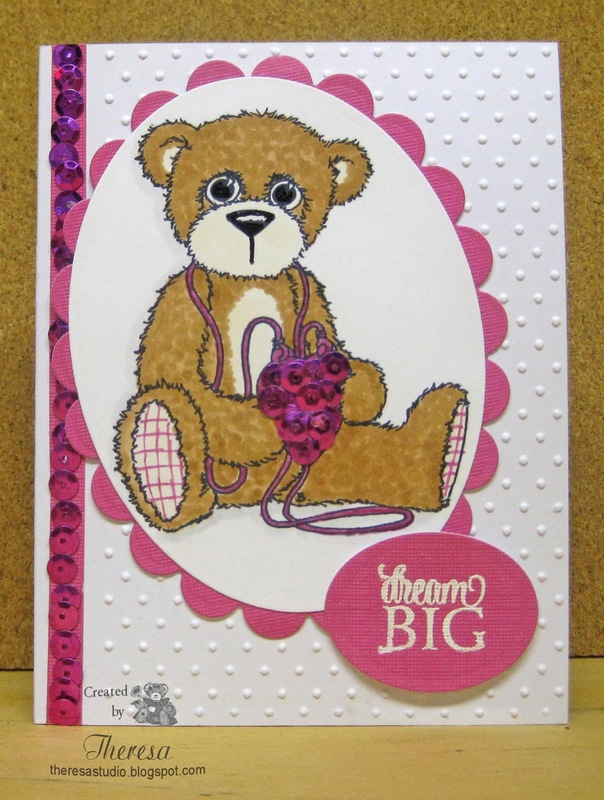 This card is for Beate's challenge "Flat is Fabulous" to create a Clean and Simple card, 1 or 2 layers, no bulky layers or embellishments, keeping it flat. 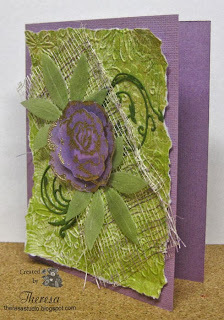 I used an Anemone image and verse with a strip of pattern paper on green card base for my flat feature. HYCCT 1301C -Read more Here. Welcome! I seem to be all over the place with the type of cards that I am posting. Today I am back with another Christmas card that I created for the challenge at Less is More with a theme of White Christmas using a color challenge of White on White. I used a GKD white Cardstock for the card base and embossed a white glossy cardstock with Darice EF Christmas Tree. I attached this to the base after trimming to the correct size and added Annabelle Stamps Pearls of various sizes to the tree and a satin Bow to finish. My Christmas greetings are on the inside of the card to keep my design very clean and simple. This will be a great card to make in quantity. Hello! Why am I talking about tomatoes and making a card featuring tomatoes? 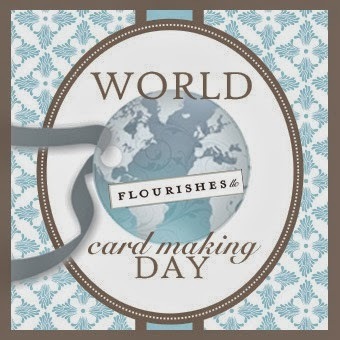 For World Card Making Day at Flourishes they thought it would be especially fun and fitting to extend a challenge that has to do with our corner of the Cardmaking World!. We are to create something that represents or is inspired by our state .Well, my corner of the world is Ohio and I thought I'd shared something you might not know or maybe you do.....the state fruit of Ohio is tomatoes. Yes, tomato is a fruit not a vegetable. Other facts: Ohio is the number three producer of fresh market tomatoes today. ( This may vary from #2 to #4 according to the report read). Ohio is the number two producer of processed tomatoes. (That's what I read on the web). The first commercially produced tomato, the pararon tomato was produced in Ohio in 1870. Reynoldsburg Ohio (a suburb of Columbus on the southeast side) has a Tomato Festival and a Tomato Parade. The fruit, Lycopersicon esculentus, commonly known as the tomato, was adopted as the Ohio state fruit in January 2009. In 1965, the Ohio General Assembly made tomato juice Ohio's official beverage. 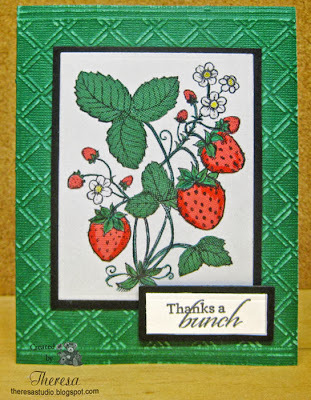 The real reason that I made this card was that I wanted to use the Flourishes' stamp from "Italian Garden" that I have never used and it fits into this challenge. 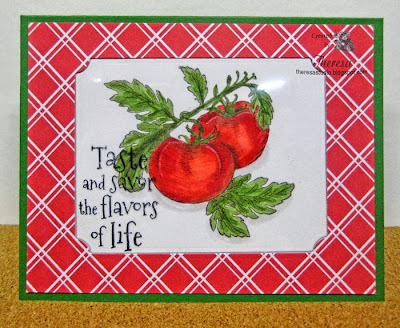 I used Memento Espresso Truffle ink to stamp the tomatoes on GKD White Cardstock and colored with Copics and Markers. I stamped the sentiment with Stazon Black ink on a piece of acetate that I layered between the image and the pattern paper in which I cut a window using a Nesties Die. 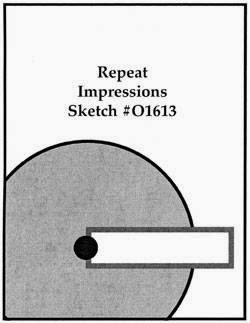 I then attached this to a card base of green Cardstock (DCWV Paper). 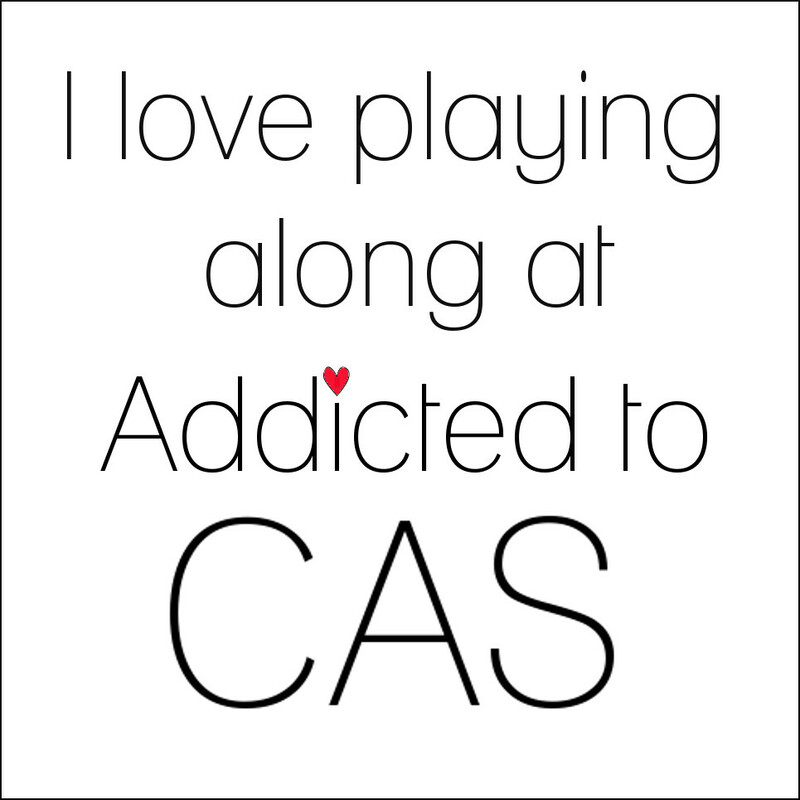 I am not sure why I used the acetate but wanted the sentiment to show over the image? Hope you enjoyed reading about the tomato in Ohio. Do not write me if you disagreed with the rankings that I quoted........ just sharing what I read for fun. 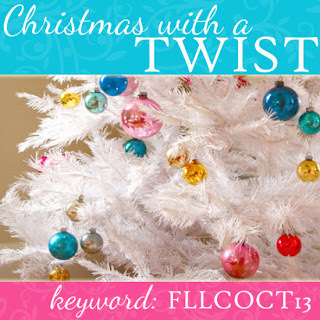 This week Flourishes has a special challenge for their Release week -FLLCOCT13-Color Challenge with a twist! We are to create a Christmas Design without the use of the color Red or Green. I love to use poinsettias on Christmas cards so I chose to use a pink poinsettia on my entry. 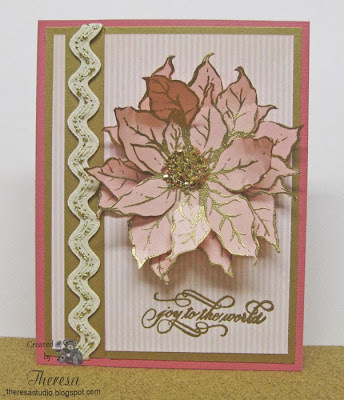 Using Flourishes Stamp from "Poinsettias and Boxwood", I stamped the flower twice on pink cardstock scraps with versamark and embossed with Ranger Gold EP. I cut both out and formed into a 3D flower. I used a deeper pink card base from DCWV pack and layered with GKD gold metallic cardstock and then a mat of striped pattern from MME. 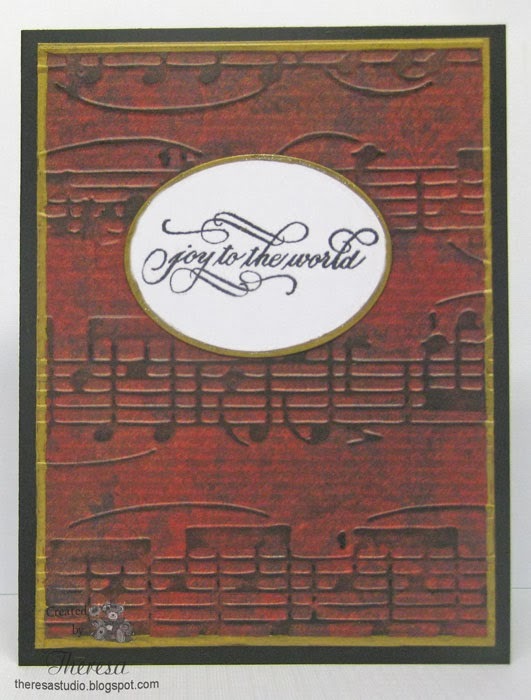 Added a strip of the gold cs topped with a rick rack from Joann's and stamped a sentiment "Joy to the World" from Flourishes "Alleluia" in gold embossing. I then attached the Poinsettia to which I added some Gala Glitz Gold from Art Glitter to the center using Art Glitter glue. The flower was attached with foam tape. Wish me luck with this challenge. Winners will receive the entire October release from Flourishes. 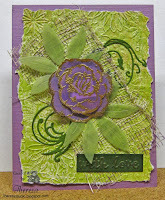 This is a second card for Joan's Gardens Challenge to make a card using Purple and Green, torn edges, layers and a product from Joan's Gardens. I made this from items on my work station that I had left over from other projects and decided to make use of them in this card. 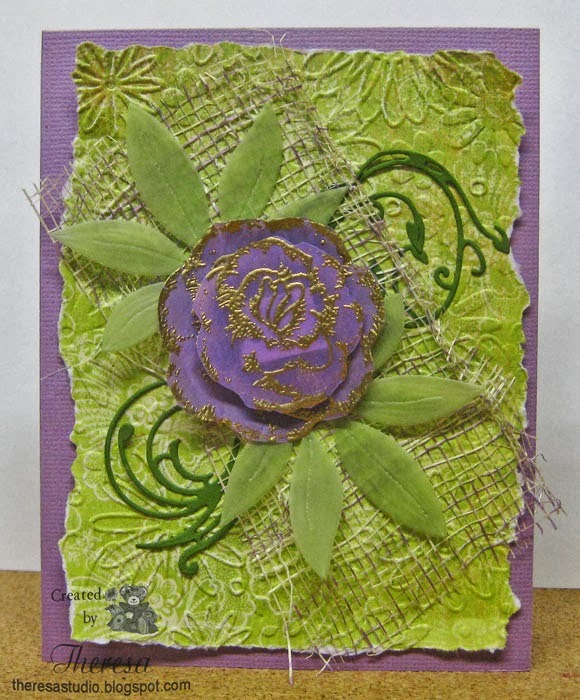 The flower was made when experimenting with vellum paper and embossing with gold embossing powder using Heartfelt Creations Grandiflora Rose stamp for an earlier card. I layered 2 cutouts but found that the gold flecks off if you try to shape the flowers so I left it flatter for this creation. 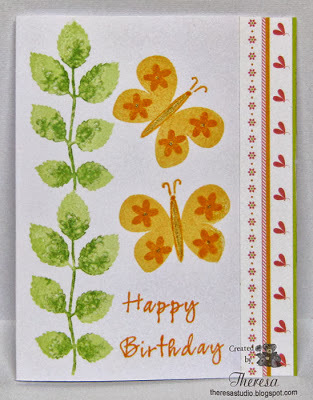 I added some Leaves cut from Green Vellum with Cheery Lynn Tropical Leaves die and some darker green flourishes that I were given by a friend and do not know the die used but think it was from Sizzix. 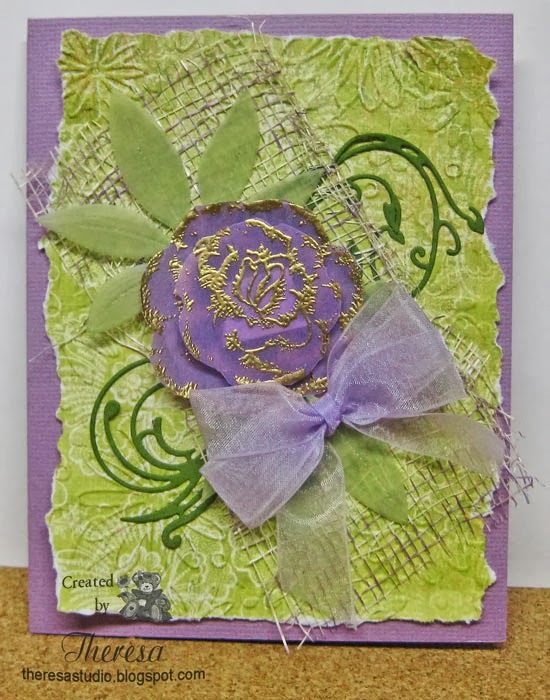 I tore some K& CO Pattern Paper and embossed it with Darice EF Flower Frenzy for a layer on top of the card base of Purple Cardstock. I added a layer of some mesh that I colored with a Copics V17. As you see in the photos I played with different looks using an Embossed sentiment on one view and then used an Organza Bow for another variation. 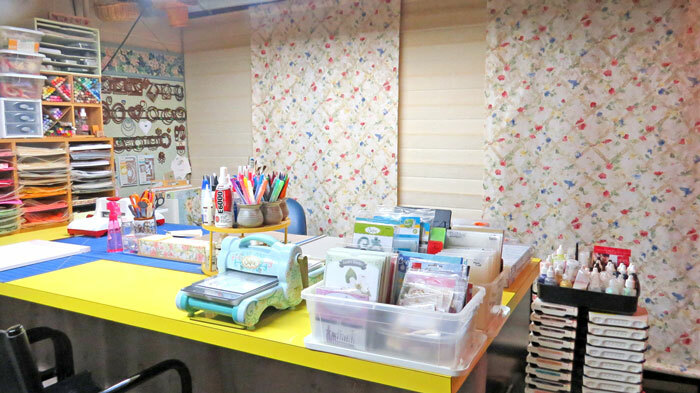 Products used that can be purchased at Joan's Gardens are Graffix Vellum Papers, Cheery Lynn Dies, Heartfelt Creations Stamps, and E6000 Adhesive. I also made this for the Splitcoasterstampers challenge Many Colors of Cancer HYCTT08. I included purple to represent pancreatic cancer which seems to be one of the most deadly and aggressive cancers and added lavendar with the bow to represent All Cancers. Hello! 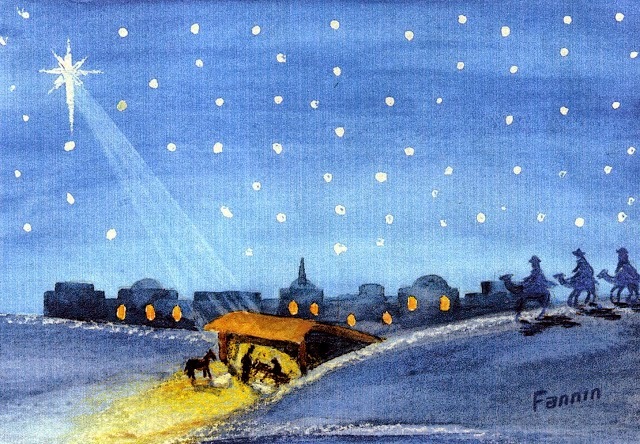 I know it is lovely fall weather but today I have a Christmas card to share. This is for a challenge at Crafty Hazelnut's Christmas Challenge to be inspired by the photo shown below. This is one time that I knew what I wanted to create as soon as I read the challenge. I started with a sheet from Heartfelt Christmas Card Collection. 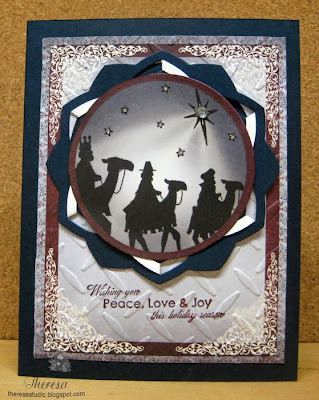 I cut out the Three Wise Men scene with Nesties circle die and framed with a Burgundy Circle cutout. 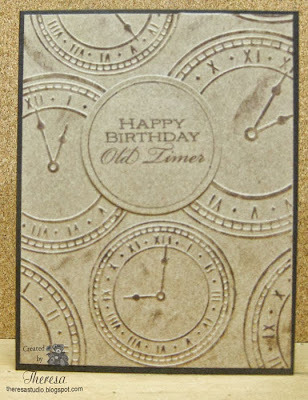 This I layered on to a design cut with a Geo Die from navy cardstock backed with white. I thought this geometric die fit well the stars in the scene. 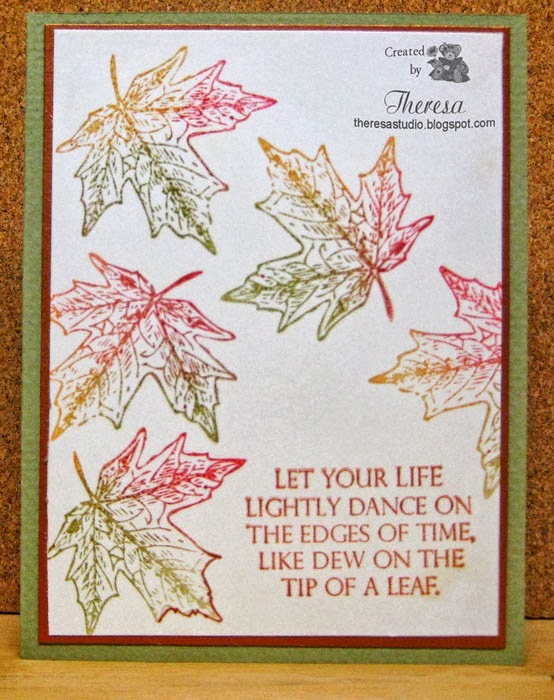 I layered this on more of the paper from the Christmas collection that I embossed with Cuttlebug EF Diamond Plate. I adhered all the layers to a card base of Navy. 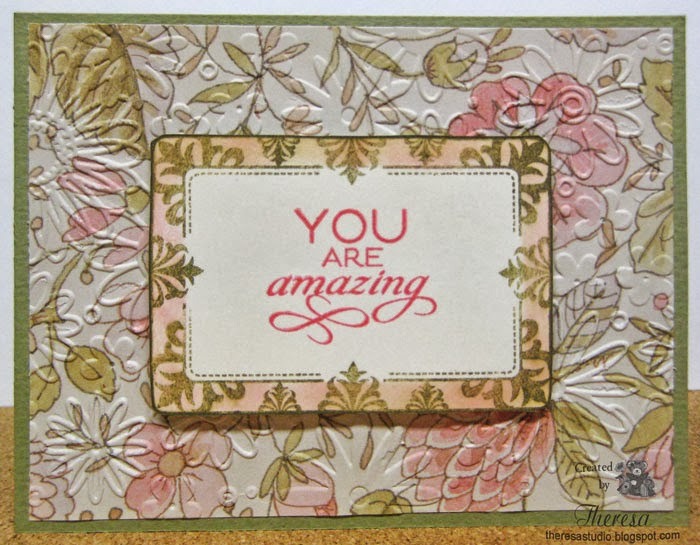 The sentiment is from GKD and stamped with SC Bravo Burgundy. I finished with a Rhinestone and used Clear Star Pen on the smaller Star for shine in the sky. 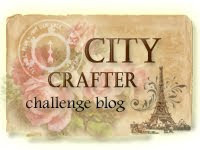 Craftyhazelnut's Christmas Challenge Extra: Anything goes for October as long as it is Christmas. Hello. Thanks for dropping in for a visit. 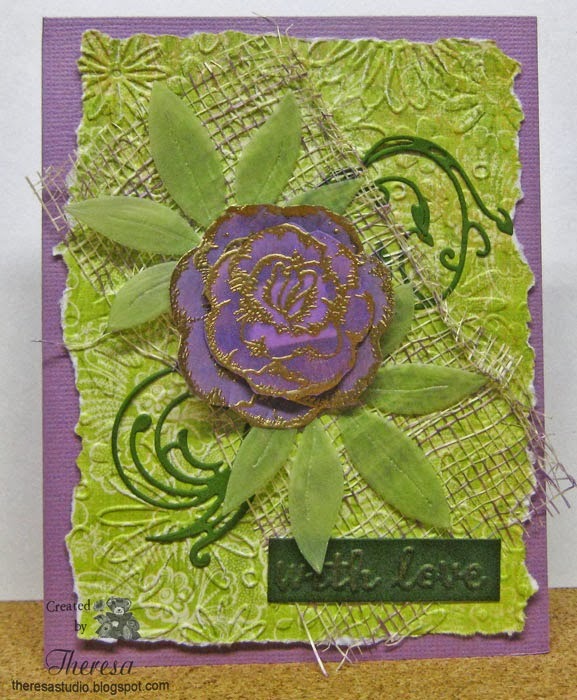 Today my card is a bit out of my comfort zone but I was trying to follow Joan's lead in a card that she created this week for her challenge.....the layers are only glued down in the middle so the edges are not flat and the edges are loose. 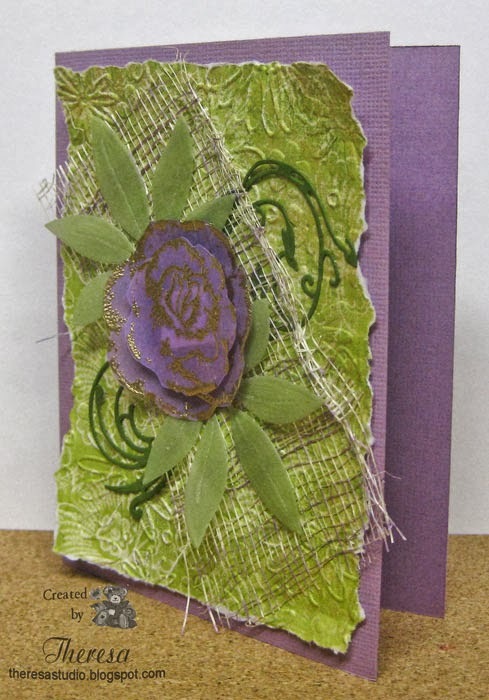 This week, Joan's Gardens Challenge was to make a card using purple and green, torn edges, layers, and a product sold at Joan's Gardens. 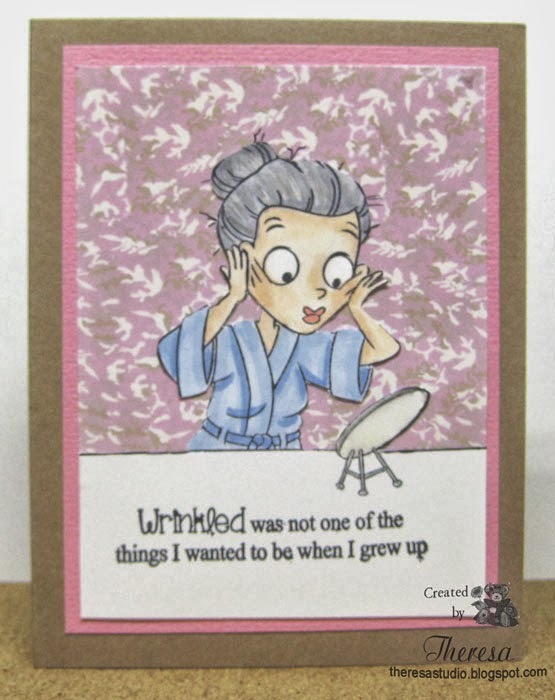 Leaving the edges of some layers not glued was my idea of copying the style of her card. 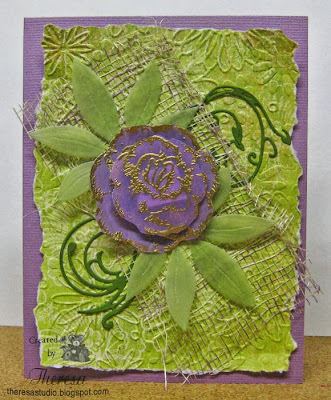 I began this project by gathering Purple Vellum Paper, light green Cardstock, a mottled pattern paper from Paper Pizazz, and a handmade paper with fibers that I have hoarded for a long time and have no idea from were that came. I did not have a plan but just started playing with these papers to see what evolved. 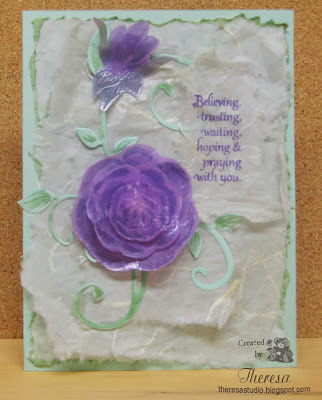 I made Vellum Flowers using Heartfelt Creations Grandiflora Rose stamp set that I stamped with Versamark and heat embossed with White Pearl Translucent EP. I shaded the back of the flowers and the rose bud with Copics V17, BV08, and G05. I fussy cut the flowers and shaped with my flower tools from Joan's Gardens. I assembled the card with a card base of the pastel green cs, then a layer of the pattern that I tore all the edges using an artist brush to wet the area to tear. The pattern paper ended up lost in the photo but shows IRL under the almost translucent handmade paper. I tore several layers of the homemade paper in varying sizes and shapes. I attached all these layers to the center area of the base and added a flourish cut with Cheery Lynn Fanciful Flourish die, then the flower that I built and the rose bud. I stamped the sentiment from Flourishes Anemones stamp set with Memento Grape Jelly ink. The smaller photo shows the card at a side angle. This Is Paper Pieced... Really! 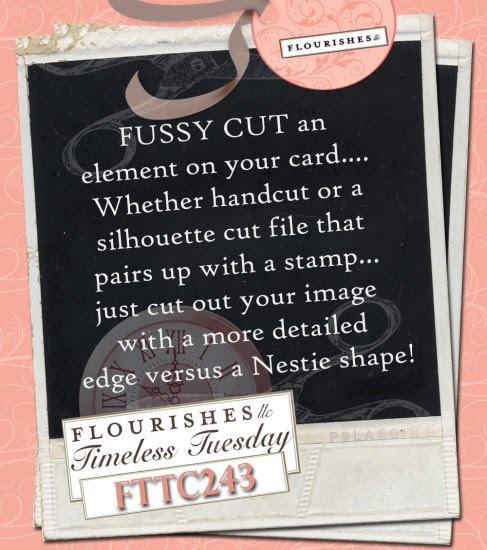 Anyone who plays the Timeless Tuesday challenge this week not only gets a chance to win the weekly prize drawing, but also may get a chance to be one of the Flourishes’ Guest Designers for December! Check out the details here. Splitcoaster Stampers: HYCCT1301B Use red or orange or both. Inks: Versamark, Memento Rhubarb Stalk, Copics R59,YR09, and 100.